Like most people, I often tend to be swayed by the recommendations of my friends. I particularly value the opinions of the lovely Antares, thanks to whom I’ve discovered lots of tasty treats. 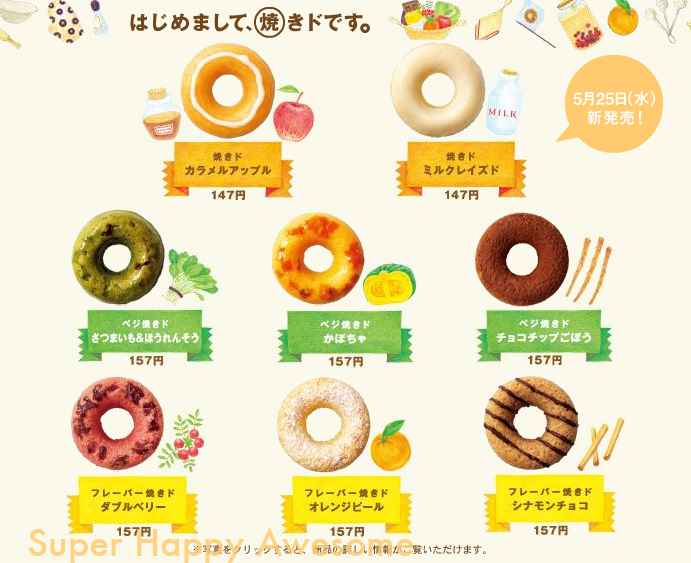 Recently she’s mentioned the new Baked Donuts series at Mister Donuts, which was first available in the Southern half of Japan a few months ago. It was recently introduced in the Kanto region, and I got a chance to try it myself this past Saturday. To tell you the truth, I kind of regret it, a little bit. Not because they were bad, though–the opposite. These things are too damn tasty. I’ve been pretty good at avoiding MisDo for the past few months, as the basic line isn’t that appealing to me. But these new ones? Dammit! I’m not sure how long they’ll be in the stores, but I see myself visiting far too often in the near future. It may not be the end of the world, as they seem to be trying to position themselves as “healthy” donuts. They’re baked, not fried, and as such have a fluffy, cakey texture that’s lighter than the usual donut. Furthermore, some of them even have vegetables included. They must be healthy! 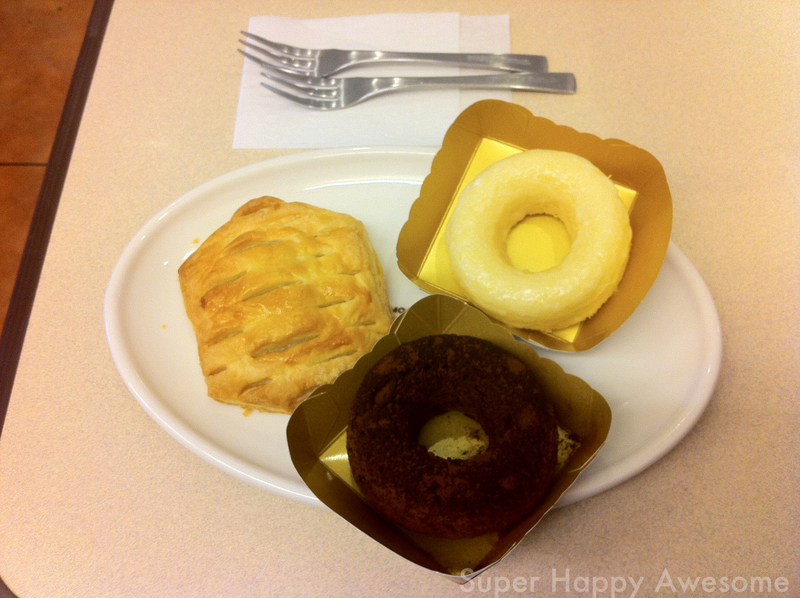 I was surprised to discover my chocolate donut included Burdock root, though I couldn’t really notice it in taste or texture. There’s also pumpkin and even spinach/sweet potato, which honestly sound more like baby foods than donut flavors. Right? I wasn’t brave enough to try the last two, but I did also have the “Milk Raised” (is that what they mean by レイズド? I’m not always quite sure with Katakana) and it was really lovely. Tasted quite a lot like condensed milk, with a nice icing glaze that sweetened things up. It was a good balance to the chocolate/burdock, which itself was pleasantly not overly sweet. I also picked up the えびグラタン or Shrimp Gratin danish for something savory. I wasn’t quite sure what to expect, but I suppose I shouldn’t have been surprised to discover that my pastry was full of pasta. After all, that’s what a gratin is in this country, but it was still kind of surreal! Have you tried the 焼きドナツ? There’s also Double Berry, Orange Peel, Cinnamon Chocolate, and Caramel Apple (which I’ll be trying next!) Which one sounds the best? Countdown to our Panel at Anime Expo: 11 Days! This entry was posted in Food! and tagged chocolate, donuts, milk, misdo, mister donuts, sweet, tasty, vegetables, weird. Bookmark the permalink. Would be fair if I didn’t post anything. I have sampled all of their baked donuts and they were good. But, you have to admit they are way overpriced. Stuff like this is why I love Japanese food so much *-* Those photos look so delicious!! Oh mr. Donut. I hear stories year after year about it.